This special Valentine’s gift is the perfect present for your loved one. It is the ideal gift for any coffee lover and is sure to make their day. For our exclusive Valentine’s gift range, our coffee experts have hand picked the best products for you to choose from. The Continental Blend was a clear choice as it has been a long-time favourite amongst our customers and coffee connoisseurs. To make the range even more special, we have designed our own unique Valentine’s labels so that you can make even more of an impact this year. Our continental beans are a unique blend of 100% Arabica beans from South and Central America. More specifically, we import them from Colombia and Honduras. We ensure to roast the beans separately to get the best flavour and highest quality. As they are from different origins, they may have slightly different characteristics, such as density or size. This is why separate roasting is so important to achieve an even roast. At Adams + Russell we always hand roast in small batches to also ensure we are achieving the highest quality with our products. These beans are roasted at a medium to full level to enhance the flavours and acidity. What does Honduras and Colombian coffee taste like? In the Continental Blend you will notice flavours of smooth chocolate and a touch of subtle sweetness. The beans have a full and rich flavour, which is enhanced in the processing and roasting stages. They have a medium acidity which offers the perfect amount of bite in your cup, making a very easy to drink beverage. Where should I buy Valentine coffee? 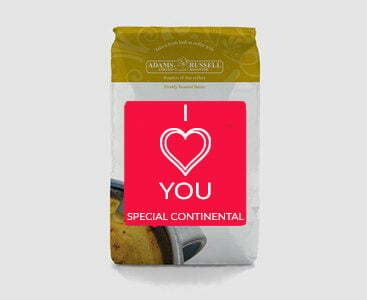 At Adams + Russell we offer a full Valentine’s coffee collection to make your shopping simple and convenient. Find special touches such as our highest quality products and exclusive specially designed labels that are sure to make a big impact this year. If you really want to go all out and surprise the coffee lover in your life this Valentine’s Day, why not make your own gift hamper with a grinder and cafetiere. If you’re looking for a larger selection of coffee, take a look at our Valentine’s Coffee Gift Set.